For over 2 years now, the Save the Accord campaign has protested against the closure of their day care centre in the East End of Glasgow. Because of the Commonwealth Games, the Accord Centre has been demolished for a bus park for temporary use during the games. Despite promises for a new build replacement centre, the Labour-led City Council now argue that the austere ‘economic climate’ means there will be no new day care centre. Instead the carers and users of the centre have been shunted to a hired room in the Bambury community centre. This facility is not an adequate replacement for the Accord Centre. Both the Scottish Government and City Council have highlighted the importance of a ‘Games Legacy’. Alex Salmond concedes that the Accord Centre carers and users have every reason to feel “legitimately aggrieved” that legacy commitments have not been fulfilled. But despite numerous assurances, no solution has been found and the whole East end of Glasgow is left with no adequate day-care facility. The group have complained of being treated like a ‘political football’ between the Council and the SNP, when all they want is the facilities they lost and were promised would be replaced. The campaign continues to fight for these services, not just for themselves, but for the whole community. They deserve our full support. ‘Legacy’ is a much abused term with very little actual meaning for the people of the East End. Accord Centre users with severe learning needs have described the loss of vital amenities, and the friendships and security provided by the centre that are no longer available. With under a year to go until the start of the games this situation must be resolved. An adequate replacement for this service, as promised, should be a priority. Anything less is an embarrassment to both the Council and the Scottish Government, and a travesty of ‘legacy’ promises that should be shouted from the rooftops. 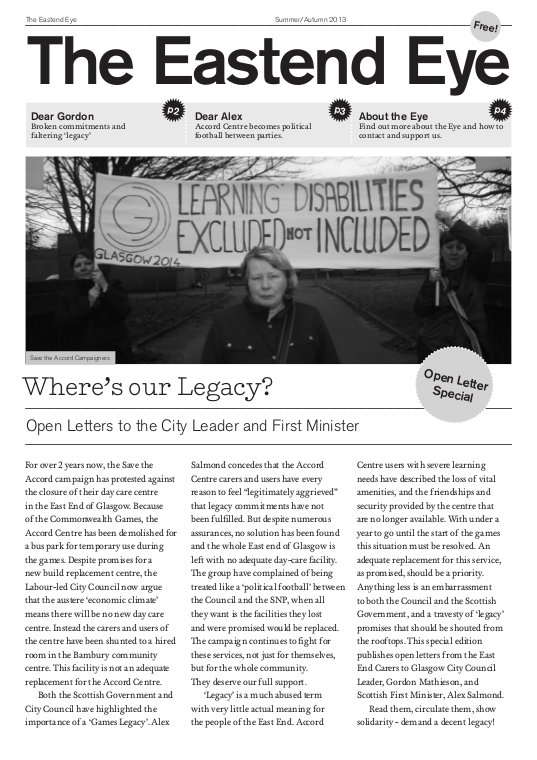 This special edition publishes open letters from the East End Carers to Glasgow City Council Leader, Gordon Mathieson, and Scottish First Minister, Alex Salmond. Read them, circulate them, show solidarity - demand a decent legacy! The relocation of users and carers from the Accord Centre to the Bambury centre in Barrowfield is unsuitable and inappropriate as we have expressed many times and as the First Minister, Alex Salmond agrees. The Accord Centre provided a vital sense of community and ‘home’ to service-users with highly specialised needs, because of the availability of specialist equipment for the learning disabled and because of the exclusive use of the building during the day. The Bambury Community Centre, for the many reasons outlined in the East Carers response to the Joint Improvement Team (JIT) report on Accord Centre re-provisioning, does not provide a substitute for the security and comfort to service-users that a purpose- built learning disability centre, such as the Accord centre, can bring. What must be emphasized again and again is that East Carers were offered a “new centre” to replace the Accord Centre - not an inadequate room in a community facility. This is evidenced by meeting minutes from an East Glasgow Community Health Care Partnership meeting (ECHCP) on 30th May, 2008. At this meeting Labour Councillor, Jim Coleman and Mark Feinmann, then East Glasgow CHCP Director, acknowledged the need for either a “new centre” or “new build centre” several times, with Mr. Coleman also making a “guarantee” that if the carers need a new centre then service will continue. In the same letter, however, David Crawford outlined a contrary position that Glasgow City Council have more recently adopted, arguing that events have changed “given the financial crisis” and thus there is “no prospect of the Council having capital to build a new centre”. We do not accept this position. We ask the City Council to make good on its guarantee to people with severe learning disabilities as a matter of urgency. We further note that a lack of money did not prevent David Crawford himself receiving an exorbitant severance package of nearly £600,000 from his job as Director of Social Work in Glasgow, while budget cuts decimate social services for the rest of us. A further open letter has been sent to First Minister Alex Salmond. We have no interest in a ‘political football’ game between the Labour Party and the SNP over this issue. We simply ask that a proper solution is found for the needs of people with severe learning disabilities in the East End as promised. We assure you that the ‘legacy’ ideal of the Games will forever be tainted if commitments made by both the City Council and Scottish Government are not ensured. We are writing this open public letter to you because a solution has still not been found to what you have described, in a letter to City Council leader Gordon Matheson, as our “legitimate concerns” over the closure of The Accord day centre in Dalmarnock for people with severe learning disabilities. In the letter, you said you were “very concerned” about the closure of the centre, stressing that “no group should feel dispossessed” as a result of the Commonwealth Games. Previously, when you visited the users and carers at the Accord centre in May 2011, you emphasised the fact that the Scottish Government - “all of us [...] every taxpayer in Scotland” - is paying 80% of the costs of the Games and you therefore have a “locus” on the issue. You also said that people in Scotland should have a “good feeling” about the Games. We assure you that we do not have a ‘good feeling’ about the Games at present. In the same meeting you said that if it could be established that a ‘like-for-like’ facility was promised on the basis that the Accord centre was being removed because of the Games, then you had “locus” to see that promise fulfilled. The evidence that the Accord centre was closed because of the Games is indisputable. The use of the term ‘like-for-like’ is your own. In fact what was offered was a “new centre”. This is evidenced by meeting minutes from an East Glasgow Community Health Care Partnership meeting (ECHCP) on 30th May, 2008. At the meeting, Labour Councillor Jim Coleman, and Mark Feinmann, then East Glasgow CHCP Director, acknowledged the need for either a “new centre” or “new build centre” several times, with Mr. Coleman making a “guarantee” that if the carers need a new centre then service will continue. Since then, of course, there has been much vacillation and denial, but as you yourself have pointed out, indications, if not absolute cast-iron commitments, were made which users and carers at the Accord centre had reason to take in good faith. The care of those with severe learning disabilities is at stake after all. The carers were even involved in helping to design and plan the new build centre - as suggested by Mark Feinmann at the meeting on 30th May 2008. In a letter to Labour Councillor George Redmond, David Crawford, former Executive Director of Social Care Services, accepted that Councillor Coleman and Mark Feinmann had given a “strong message” to the East End carers group “that a legacy development was possible”. He further stated that Raymond Bell, head of Mental Health, had confirmed Councillor Coleman and Mark Feinmann’s “commitment” to the carers was “genuine”. As your letter to Council leader Matheson states, the carers and users of the Accord Centre have every reason to feel “legitimately aggrieved” that legacy commitments have not been fulfilled. You also said that the ‘ideal’ of showcasing this city to the world “cannot be sustained” with such a tawdry outcome for some of the most vulnerable people in Glasgow on the site of the Games. In a letter to the East carers group you said you were “committed” to “ensuring” that the legacy of the Commonwealth Games includes recognition of the needs of people with a learning disability. You proposed that the new Tollcross Aquatic Centre could be adapted for use after the Games to “ensure” that a modern facility similar to the excellent Harry Smith Complex in South Lanarkshire be made available for people with learning disabilities. That assurance filled users and carers of the Accord Day Centre with great hope. Yet the commitment remains unfulfilled. Meanwhile, the inadequate Bambury Centre, as you yourself acknowledged in a letter to Council Leader Gordon Matheson, provides an impoverished solution to the specialised needs of people with a learning disability. When you visited the Accord Centre you had just been elected First Minister of Scotland. It was perhaps easy to make commitments in that moment, but reality bites for people with disabilities in the East of Glasgow. We have become accustomed to being used as a ‘political football’ between the SNP and the Glasgow Labour Party. We ask you now to follow through on your previous commitment, to use your self-declared “locus” to ensure that the Commonwealth Games 2014 does in fact contain a ‘legacy’ for people with a learning disability in Glasgow. A further open letter has been sent to City Leader Gordon Matheson. We ask you both to resolve this issue immediately. We assure you that the ‘legacy’ ideal of the Games will forever be tainted if the commitments made by both the City Council and Scottish Government are not ensured. We have become accustomed to being used as a ‘political football’ between the SNP and the Glasgow Labour Party. We ask you now to follow through on your previous commitment, to ensure that the Commonwealth Games 2014 does in fact contain a ‘legacy’ for people with a learning disability in Glasgow.